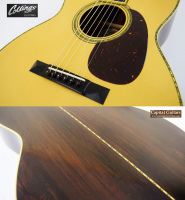 This beautiful instrument has nearly all of the very best features that you could ask for in a Collings 000-12 fret: a tight-grained German Spruce top; AAA-graded Brazilian Rosewood that can no longer be had for the back and sides; top of the line cosmetics including Abalone inlays and invoroid binding everywhere; and to top things off, a full gloss varnish finish. Heavens, this guitar has it all! 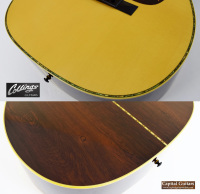 Other critical specs include: 25-1/2" string scale; 1-13/16" bone nut; Modified V neck shape; 2-5/16" string spacing. Built in Bill Collings' heyday era, this guitar is simply magnificent. It seems almost alive in your hands and the tone is majestic. Playing this instrument is a cathartic experience. My crude sound sample doesn't do the guitar justice, but check it out; this guitar has a voice that sings. 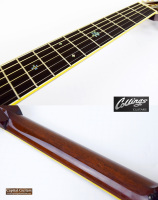 It plays superbly too, with 9th fret string heights of 6/64" and 4/64" and with just a smidge of neck relief. It is currently setup up with my standard Elixir 80/20 lights. 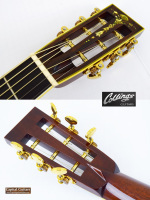 Collings 14833 is in excellent condition, despite it's decade of adoration and play. Only the lightest of scratches are to be found in it's wonderful varnish finish. It shows a few capo marks (not impressions) on the back of the neck which may be the worst of it's minor cosmetic flaws (see the neck photo). I am told the back once had a surface crack, as fine Brazilian is known to do, but I'll be damned if I can find any evidence of the repair. The incredible Brazilian now shines like a much newer instrument. 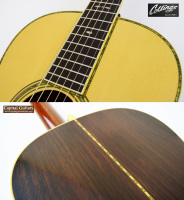 It comes in it's original Collings /TKL case which is also in excellent condition.